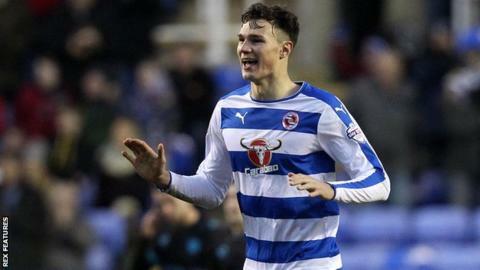 Reading manager Brian McDermott praised defender Jake Cooper after going to Doncaster to watch him make his debut for England's Under-20 team. Cooper has made 21 appearances for the Royals this season after breaking into the first-team set-up last term. The 21-year-old featured alongside Manchester United's Marcus Rashford in the Young Lions' 2-1 defeat by Canada. "We think there is a lot of potential there and we have always tried to bring the young players on," said McDermott. "He did really well and he was comfortable in the environment. He has got a lot to do and learn but the one thing about Jake is that he wants to learn and get better." "I have discussed with him what he needs to do. He comes in every day, he's learning in the team which is really important. If he makes mistakes now, it will be a mistake he will not make next season. "We have an awful lot of younger players playing international football. It's a great honour for them and a great honour for our club." Reading players returned to training on Tuesday after several members of the squad were away on international duty over the Easter period. McDermott used some spare time to track the progress of some of his younger players, including Cooper and Dominic Samuel, who is currently on loan at League One club Gillingham. "It was good for me to get around and watch some games," the 54-year-old told BBC Sport. "I went to see four games actually. I went to a game Friday, Saturday, Sunday and Monday." McDermott's side return to action at Bolton in the Championship on Saturday, looking for their first win in six matches.